The v-berth bed was made up of multiple cushions which we found uncomfortable. It seems like you are always laying in a crack and there is no way to make the sheets nice and tight. We decided to order a new mattress and debated between memory foam or an inner spring mattress, but ultimately decided on the foam. We thought it sounded more comfortable, was cheaper, and easier to dry out if it got wet. 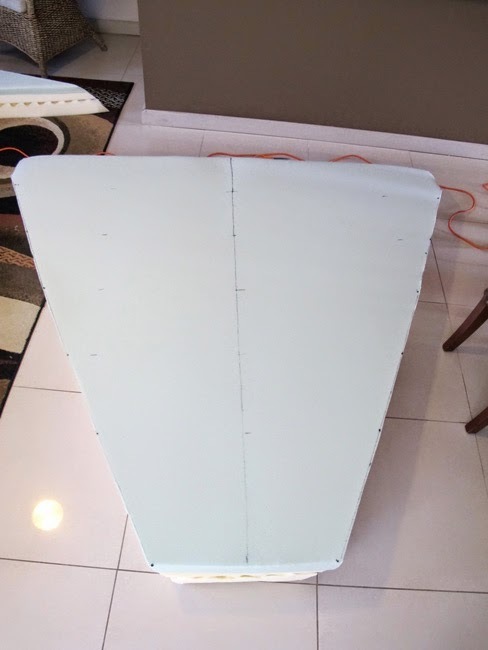 We read in a few of the sailboat forums about the Spa Sensations memory foam mattress from Wal-Mart. As much as I can't stand Wal-Mart, the mattress was super cheap and had 3700 positive reviews. We got the 8" Spa Sensatins Memory Foam Mattress for $260 (it's dropped to $199 now of course!). It comes with a nice zip up cover on it and is so comfortable! 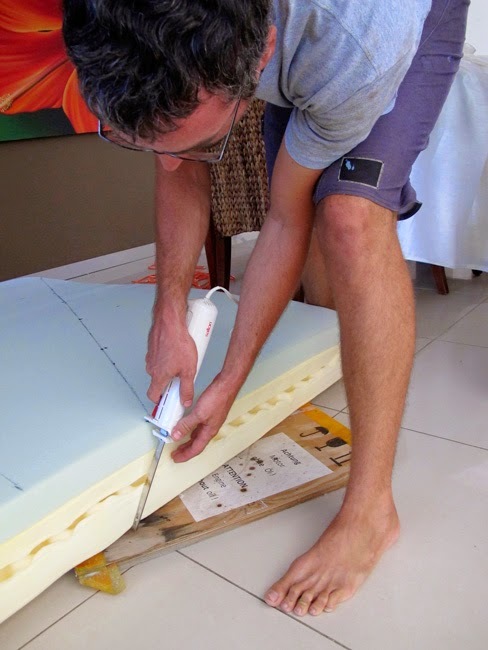 Matt measured the dimensions of the v-berth and then drew it all out on the mattress. Then he cut it with an electric bread knife which was really easy and doesn't tear it. You can see the mattress is 3 layers. It's memory foam on top and then higher densities on bottom. And it fit perfectly! I cut and resewed the zip up cover (see here for that post) so that it fit the new shape. Check it out! It's huge! It's as wide as a king size at the head and goes down to about 20 inches at the foot. Loads of room for 2 people! Can't wait for you post on re-sewing the cover. Do you buy the sheets or do you make them. It seems like making the bed will be difficult in a V Berth or am I thinking too much on it? I will publish the sewing post as soon as I get it done! I decided to make the sheets instead of buying the pre made v-berth sheets because they are so expensive. I had to buy king size sheets b/c the head of our bed is 80". Then I just had to cut the sides and remake the bottom corners - not too bad. It is a bit tricking making the bed! Definitely not something you wanna try and do midday in the heat! I made the fitted sheet with a pocket at the foot so that I could slip it on and pull/straighten from the head (and and it helps keep the sheet nice and tight at the foot). The fitted sheet is just cut down to remove so much excess from the foot area, but not tucked in b/c we are 'flat sheet untucked' kinda people. Thanks for the informationn. All of your valuable knowledge is going into my diary for my transition between landlubber and novice sailor. Did you buy a full size? I am finding your site very useful and inspirational! I just bought my first sailboat and am buying this mattress to do the same for my v-berth! We actually got a King size b/c the width at the head of the bed is 80 inches. The King size mattress is 76 inches wide so we used that and cut off the excess from the sides. Just measure the head of your bed space and choose the closest fitting mattress. The mattress is soooo comfy! Good luck! Great idea! We just bought a 27' Aloha and are prepping right now for our first spring with it in Lake Ontario, so looking for useful projects for the winter. Thanks for the awesome tip! These are adorable. Our girls would have loved those when they were little. Now that you've had the mattress for a few seasons, would you still recommend it? I'm looking to tackle a similar project this year! Yes, for sure! The mattress is awesome! This is exactly what I planned to do! So excited you did this and posted, you made it much easier! Did you cut it in half to get it into the boat? Nope, it's foam so just fold it in half and push with all your might. It takes 2 people and is awkward, but it fits! Many people complain that lying on a memory foam mattress can get too hot but a wool best mattress topper will guarantee you a more comfortable night of sleep. 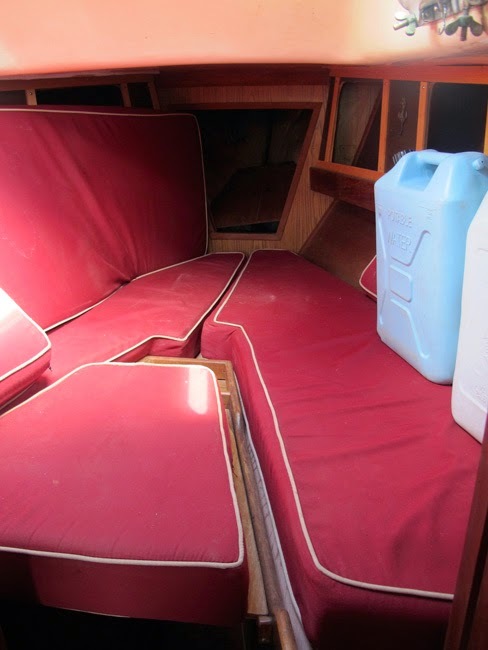 Sofa bed will be used in your yacht as it's good to be sit on that.In my yacht i have all the sofa beds with high quality mattress on it and i prefer yacht mattress cleaning once in a week after the tour so that it will free from bed bugs and dust. Did you remove the original cushions? Or did you just put your mattress on top? Also, Is having the full mattress ore difficult when accessing storage below?